BlackBerry Storm coming to Verizon? | BlackBerry Blast! BlackBerry Blast! > News > BlackBerry Storm coming to Verizon? BlackBerry Storm coming to Verizon? For months we heard about a touchscreen device supposedly called the BlackBerry Thunder. Gizmodo and BGR went back and forth on whether the device was called the Thunder or Storm. Perhaps they were both right. 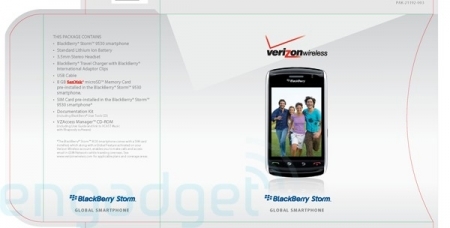 Engadget has unearthed a BlackBerry Storm box with Verizon logos all over it. Could "Thunder" have just been the working name? Who knows, but this picture looks legit. Stay tuned.